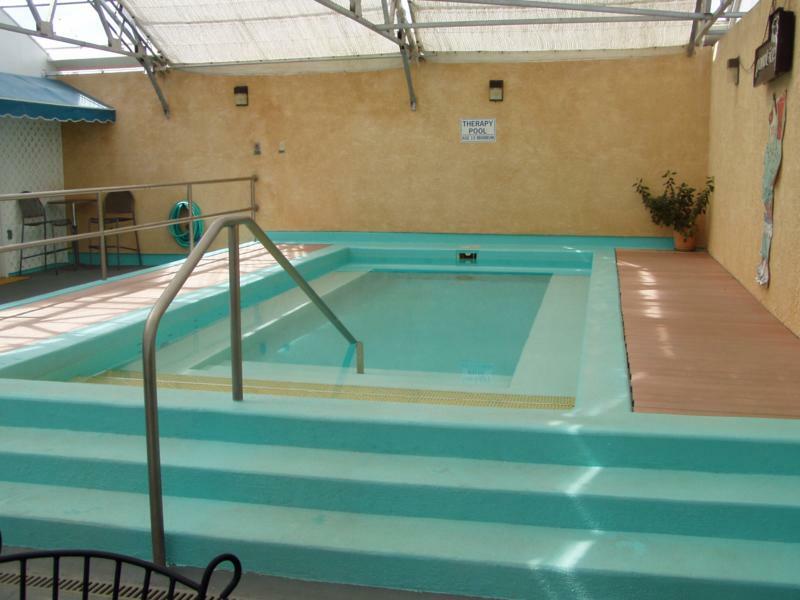 The Sand Dunes Swimming Pool is a family owned, natural artesian hot springs pool. The pool is kept around 98-100 degrees Fahrenheit and the spa is around 105-107 degrees Fahrenheit. Believe it or not but the water comes out of the ground at this temperature! 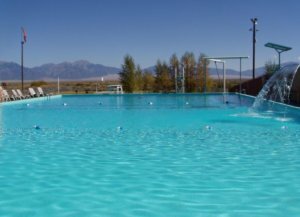 The Sand Dunes Swimming Pool is open year round despite the cold winter temperatures the San Luis Valley receives. The pool area also offers sand volleyball courts and a basketball court for those that need a break from the water. 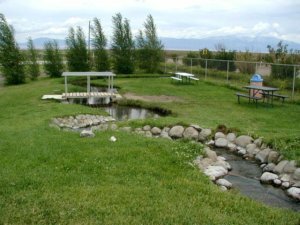 At the east end of the pool area there is a little stream with picnic tables and grills, perfect for a summer cookout. Don’t forget your sunscreen because you will burn easily at the high elevation. The pool also has amazing views of the Great Sand Dunes National Park as well as the Sangre de Cristo Mountain Range. The Sand Dunes Swimming Pool is located in Hooper, Colorado approximately 20 miles north of Alamosa. It is in a remote area of the San Luis Valley so online maps, such as Google Maps, have difficulty giving you exact directions. The address is 1991 County Road 63, Hooper, Colorado 81136. Once you get in the area of the Sand Dunes Swimming Pool there are signs. If it is at night, it is one of the main lights in the area. Take Highway 17 south towards Alamosa. At Road B turn left. Go about 1½ miles, then turn left. The pool will be on your left after a half a mile. Take Highway 17 north towards Salida. Turn right onto Road B. Go about 1½ miles, then turn left. The pool will be on your left after a half a mile. Drive east until Highway 17 and turn left. Then turn right on Road B. Go about 1½ miles, then turn left. The pool will be on your left after a half a mile. The main roads that you should take to reach Highway 17 are Highway 112 through Center, Colorado, Lane 5 North or Lane 7 North. All these run east to west and intersect with Highway 17. Even though it may seem difficult to access, it is really simple. 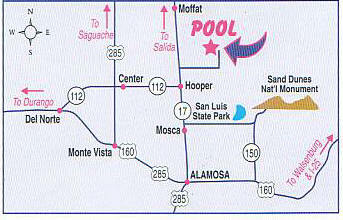 If you get lost don’t hesitate to call the Sand Dunes Swimming Pool and have them help you at 719-378-2807. The regular hours from March 1st –November 30th are 10 a.m. to 10 p.m. and the winter hours from December 1st –February 28th are from 1 p.m. to 8 p.m. The Sand Dunes Swimming Pool is closed every Thursday for cleaning. The pool is also closed on New Year’s Day, Easter, Thanksgiving, and Christmas. Their yearly maintenance is in April and the pool is usually closed for approximately ten days. If you are going to be in the area for a while, the Sand Dunes Swimming Pool offers monthly rates, family rates, and swim punch cards. There are group rates for groups of 20 or more, but you must pay in one transaction and have at least 24 hour reservations. The pool will gladly reserve tables for FREE for your party so just let them know how many and when you will arrive! If you arrive one hour prior to closing there is a discount rate of Adults $6.00 and children $4.00. The concession stand is top of the line, offering all the normal snacks and then some. They also offer fresh salads with tomatoes and cucumbers that are grown on-site at the greenhouses. The Sand Dunes Swimming Pool also allows outside containers so you can bring a cooler full of your favorite foods and drinks. The Sand Dunes Swimming Pool provides toy rentals featuring volleyballs, swimming noodles, diving rings, and much more. My favorite time of year to visit the Sand Dunes Swimming Pool is during the winter. There is something surreal about swimming when the snow is falling and there is steam coming off the water. The only disadvantage to going in the winter is the diving boards can be closed due to ice. You also have to make a decision to get your hair wet and keep rewetting it or leave it dry because you hair will start to form ice sickles and your head gets cold! 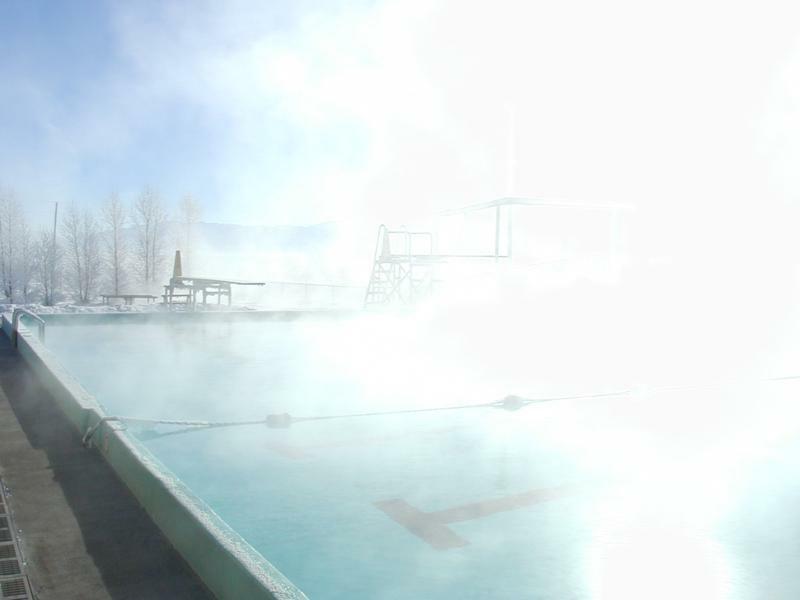 And boy is it cold when you get out of the pool but the steam experience is worth the cold! I also like to go at night any time of the year as there are so many stars to see. Summer can be a fun time but I often find that I start to overheat with the hot summer air and hot water and spend more time sitting out of the pool than in it. All in all, it doesn’t matter when you go as the water and views are wonderful. However, I would suggest getting in the pool before trying the spa. If you get in the spa first and then go to the pool it will seem cold even though it’s 100 degrees Fahrenheit. The water enters the pool at the southwest corner. This is where you will find the hottest water and then it begins to cool as it travels to the deep end. On the wall next to the baby pool you will find a bench that allows you to sit near the incoming water and enjoy the heat. 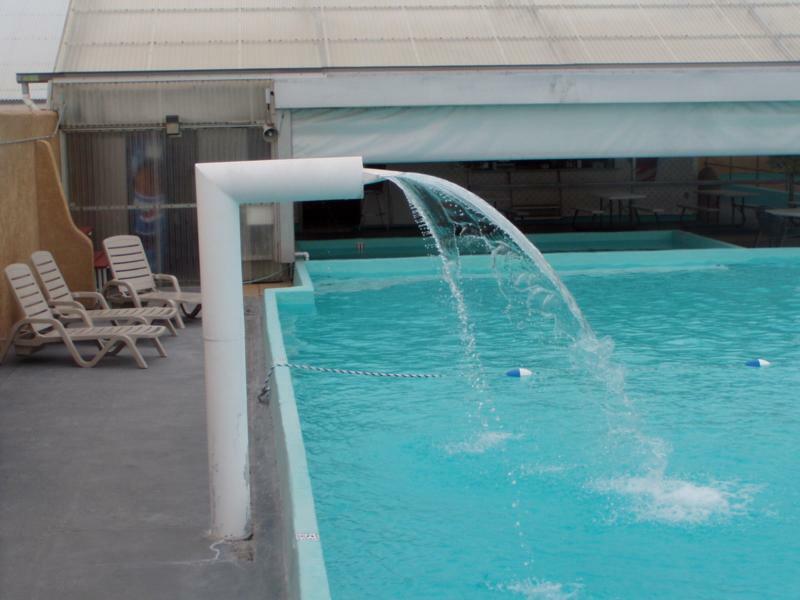 Mainly in the summer there is a water fountain running which allows the water to cool before entering the pool using the outside air temperature. It is fun to sit under it and allow it to massage your back.